Chocolate Shavings: July Cookbook Giveaway! As promised, here is the Chocolate Shavings cookbook giveaway of the month! I'm giving a copy of Clean Start, Inspiring you to Eat Clean and Live Well to one lucky reader! The summer being in full swing, it's really the perfect time to start eating right (if you weren't before!) 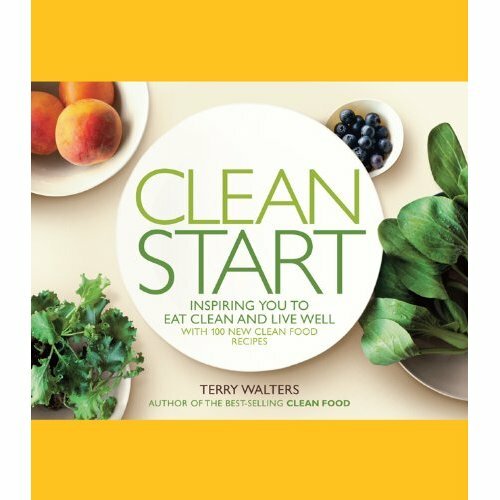 Terry Walters' book is a wonderful resource for all of us who love food but also want to properly nourish our bodies and eat healthy, delicious, balanced meals. The book takes you through a variety of methods to eat right. The book is based on some pretty fundamentals principals: eat local whenever you can, know where your food comes from, read labels carefully but try to avoid food that need them - and eat foods with beautifully vivid colours with a lot of healthy greens. Terry Walters' gives you some easy to follow tips with some fabulous meals ideas using some ingredients you'll love to add to your diet like miso, ginger root and tofu. Here are just a few of the mouth-watering recipes you will find in the book: Maple Mustard and Tahini Glazed Carrots, Green Beans with Figs and Pistachios in Balsamic Reduction, Rhubard Cream with Strawberries and Candied Ginger. To win a copy of the book, leave a comment on this post or write a comment on Chocolate Shaving's facebook page. You can write a comment on both and your name will be entered in the contest twice. Simply let me know what healthy meals you like cooking the most. If you haven't been cooking a lot of healthy meals lately, poke around the recipes on Chocolate Shavings and comment on the ones you'd like to try! The contest ends on July 28th, at midnight. The winner will be drawn at random and you must be a Canadian or American resident to enter. Good luck and I look forward to hearing from you! Sockeye salmon is plentiful and on sale at my local grocery store, so we've been eating that in various preparations. Our garden has also been providing us with lots of herbs, peas, lettuce, carrots, beets, and just today green beans, so we've been eating lots of fresh stuff. I LOVE trying new recipes and the ones from the book that you mentioned sound great! Our garden has been providing us with lots of herbs, peas, carrots, beets and just today green beans! So we have been eating lots of veggies and I LOVE finding new ways to cook them. The recipes you listed from the book sound great! I really like cooking with herbs, spices to bring out flavor, rather than piling on heavy sauces, my favorite is cooking with fish and chicken, an abundance of fresh veggies, and sometimes, a hint of coconut milk. Thanks for hosting this giveaway! My favorite healthy dishes to create are salads and sauteed veggies! I love to gather things from my own backyard garden to throw into all sorts of flavorful and colorful combinations. And sometimes just a little bit of olive oil, salt, and pepper can do wonders for some vegetables. Fresh whole foods are the best! O that looks like a wonderful book! Gotta check it out. I'm always interested in finding new ways to eat healthy and I think my favorite health food must be colorful and versatile salads. Love them! I'm loving all the really good fresh produce. And the local farmer's market is bursting with it. We make a lot of fresh salads and they're different each time. I like using fresh herbs and grilled vegetables. using a little bit of EVOO on top. Using fresh produce, making all kind of salads. This book sounds great!!! Never too late to eat wisely. Almost everything I make in the summer is healthy. My favorite so far has been broiled salmon with a spicy tomato peach salsa. The tomato peach combination is a real winner. I'm a salad addict!!!! LOADS of fruits, veggies and nuts with homemade dressings. Yum! This is the first year we've participated in a local CSA, and we're loving the overflowing fresh vegetables. Some of my favorite new healthy recipes include a potato and summer squash salad dressed in a marjoram lemon vinaigrette, and a perfectly lovely caprese salad made with fresh tomatoes, basil and locally made fresh mozzarella. I make pesto when the basil gets out of control and we end up using it on everything! My favorite healthy meal to cook is fish...I have one recipe I love that combines braised white fish (such as cod) with roasted red peppers, fennel, and a few olives. So tasty! My favourite healthy meal lately has been chilled soups...I've tried various combinations with avocado and absolutely loved all of them! Also peas, beets, and a fruity canteloupe soup! I would love a chance to learn and cook from this book! Count me in. Sounds like an interesting book -- I'd love to read it! I like making salads with seasonal fruits and vegetables, with homemade dressing! I have been making a ton of Quinoa, bean and veggie salads. So easy to make, and the leftovers make a greatlunch the next day! I'm loving various Vitamix recipes at the moment, using farmers market produce. Best so far? Tortilla soup! Fruit for brekkie, soups for lunch and salad for dinner! My favourite healthy food is kale, drizzled with olive oil and garlic salt and then roasted in the oven for 10 minutes. I put on lemon juice and yeast flakes once it's out for extra flavour, and eat the chips like popcorn! I've become obsessed with all the awesome things to make with quinoa. Also, buying local has become increasingly important to me. Thanks for the giveaway! My husband and I are eating with those exact principles in mind. How perfectly this book would compliment our lifestyle! I've really become a fan of vegetarian sides that can also do double-duty as stand-alone lunch dishes. I've recently posted about grilled summer vegetables and whole wheat orzo, and also have a yummy southwest couscous that is packed with healthy flavors as well. I am always interested in learning new ways to eat well from both a healthy AND tasty standpoint! Salads are my mainstay for healthy meals. All manner of raw veggies go into them. Another favorite is panzanella when tomatoes are at their peak. I like to cook with salmon or ground turkey. This book looks amazing! I've been really into stir frying veggies (carrots, broccoli, mushrooms, snow peas) with a bit of brown rice and soy sauce. My secret is the McCormick Grill Mates Smokehouse Maple seasoning. It's meant for grilling meat, but I love the flavor it gives to my veggies! I am trying so hard to eat healthy and drop weight. Tonight I made a salad of bulgur, poached chicken, garbanzo beans, tomatoes and cucumber. I love a good cookbook! I've been eating more quinoa and salmon lately. A healthy meal I enjoy preparing is marinated chicken with sides of steamed veg and couscous salad!